I hope you’ll humor me with this one last ode to summer. So what if we went to a football game and then went apple picking last weekend? So what if it was in the 50s last week? So what if I actually thought about getting my boots out of the closet? It’s not fall until Friday. Maybe she was a well-practiced saleswoman; maybe I was going to buy them anyway. It doesn’t matter. They came home with me, along with a large box of tomatoes to make Smitten Kitchen’s scalloped tomatoes with croutons (omg. please make if if you haven’t already). And a half gallon of apple cider. Because I have to face facts on Friday. I was fully prepared for those peaches to be mealy, or flavorless, or generally unsatisfying, as near-out-of-season fruit can be. I was wrong. So I knew I couldn’t let the moment pass me by. 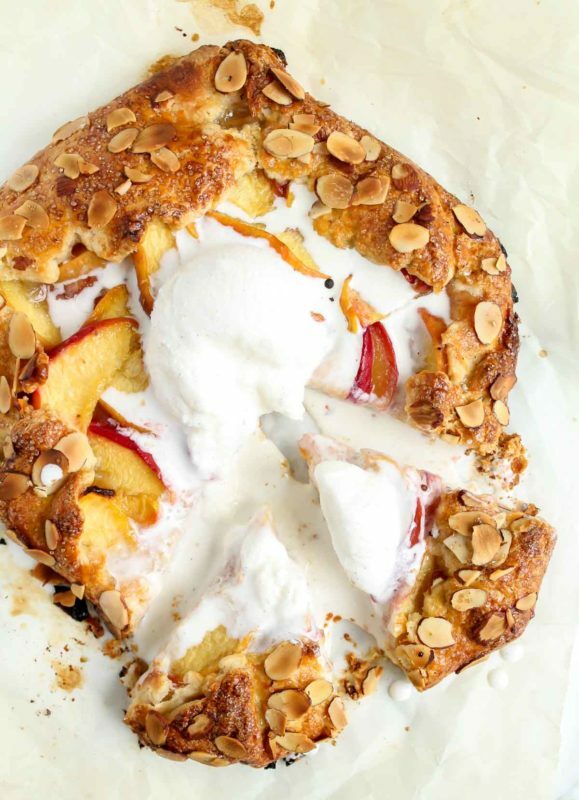 Brian and I could easily have eaten them all plain, but I set aside a few to make this peach almond galette. 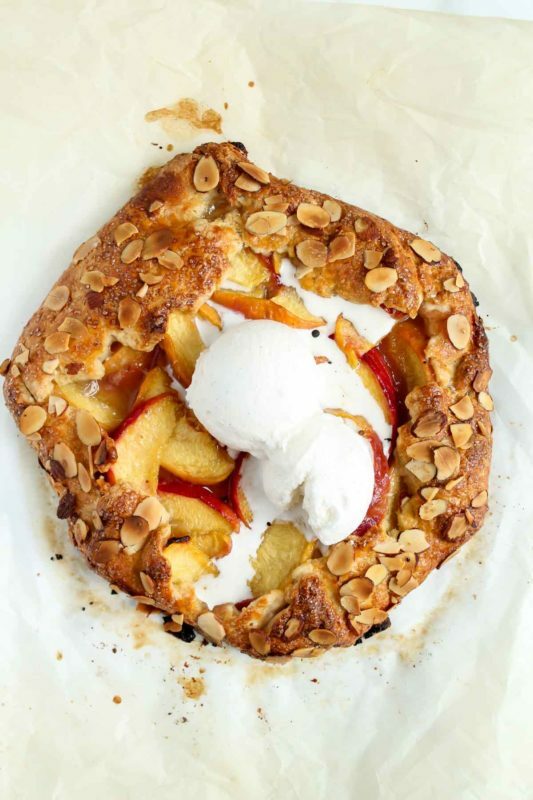 Because a galette is just a really easy version of a pie, and when given the choice, I usually pick easy over pie. 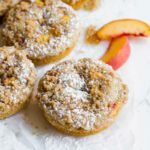 All you have to do is make a half pie crust recipe (I make mine in the food processor and it’s super fast), chill it while you slice up the peaches and toss them with some sugar and spices. 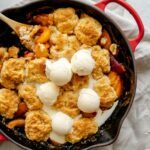 Then roll it out, dump the peaches in the middle, fold it over any which way (the more misshapen, the better), brush with some egg, sprinkle with sugar and almonds, and bake. On the scale of easy, pie just does not compare to this. Where did the phrase “easy as pie” come from, anyway? After baking at a fairly high heat, you might have a little leakage from the peach juices…no matter, it will be delicious regardless. Once it’s done, all that’s left to do is top with ice cream and serve it up! 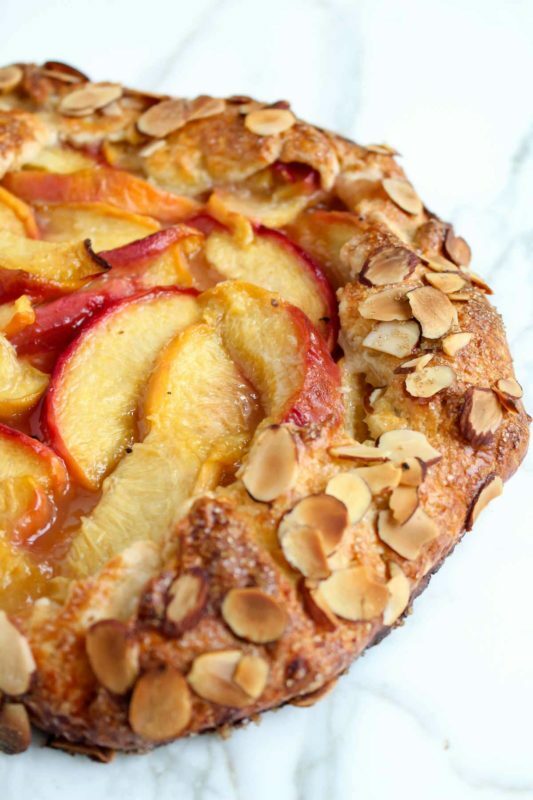 The combination of sweet peaches, delicate almond flavor, and super crisp, buttery crust, is nothing short of fantastic. I hope you’ll find yourself some peaches and make it before summer officially leaves us. 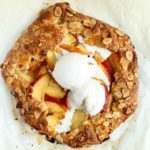 Sweet peaches, delicate almonds, and an all-butter crust come together in this simple peach almond galette. Combine all ingredients except buttermilk in food processor. Pulse until butter is well combined with the flour mixture. Add buttermilk and pulse until a dough forms. Turn dough out onto a clean surface and shape into an even, flat disk. Wrap in plastic wrap, then roll the sides to form an even edge, refrigerate for 1/2 hr while preparing the peach filling. 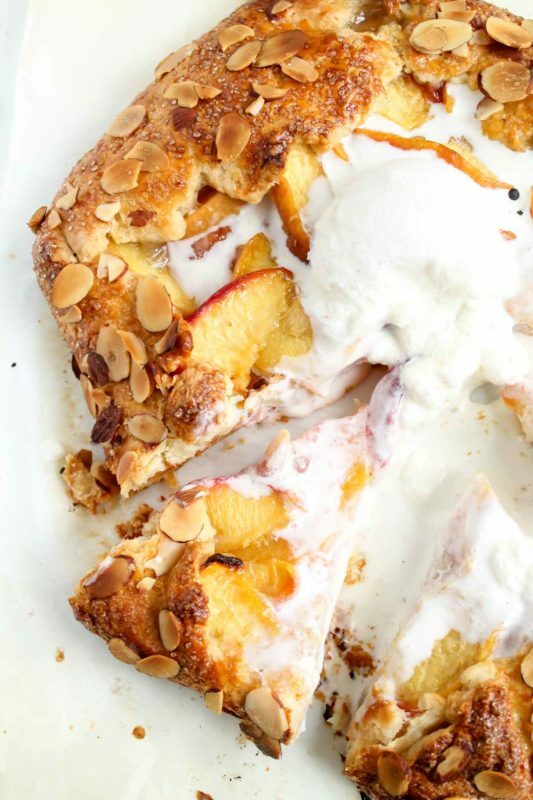 Combine peaches in a large bowl with lemon zest, lemon juice, sugar, cornstarch, salt, and almond extract. Stir to fully combine. 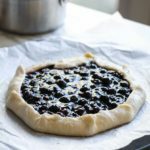 Preheat oven to 400 degrees F. On a clean countertop or surface, roll out the dough to 1/4 inch thickness in an even-ish circle. Place the circle of dough on a parchment-lined baking sheet. Dump the peach mixture in the center and spread it out to within about an inch of the edges. 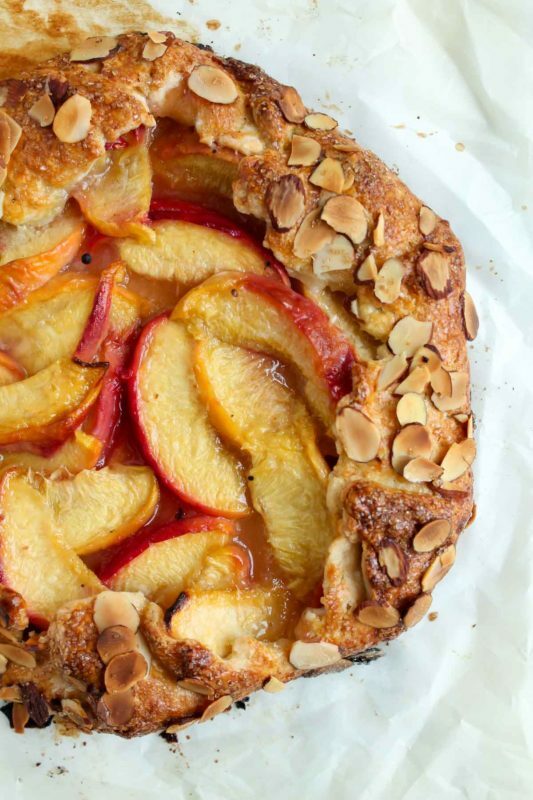 Fold the edges of the dough over the peach filling, creating a freeform pie shape. 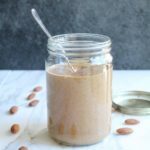 This can be very rustic, and certainly does not need to be perfect! Just try to keep it even and not create any holes for filling to come out. Brush the folded-over edges of dough with the egg mixture, then sprinkle with sugar and sliced almonds. Bake for about 45 minutes, until crust is golden brown and filling is bubbling. You may have some filling leak out, and that's ok.
Store leftovers in the fridge for up to 3 days, though galette is best the day it's made. Please serve with ice cream. Just trust me.